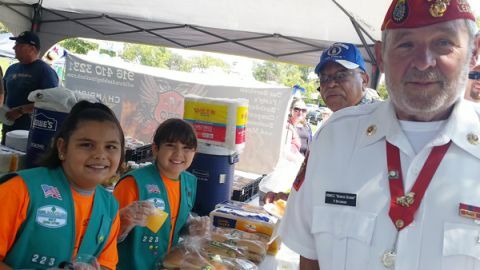 The girls of Girl Scout Troop 223 were eager to help serve the veterans and went above and beyond their own service during the day. On Saturday September 27th Citrus Heights held its 7th Veterans Appreciation Picnic at Rusch Park. Some 400 Veterans and their families came to this annual event to spend a day relaxing, listening to music, checking out the many veterans’ resources, and hopefully winning one of the many great raffle prizes. The event was collaboration with the Citrus Heights American Legion Post 637, members of GFWC Citrus Heights Women’s Club, American Legion Auxiliary Unit 637, Citrus Heights Lions Club, Reichert’s Funeral Home and others who donated food, supplies and the many raffle prizes. This year’s guest of honor was Alejandro Jauregui of Williams, CA. Jauregui served two tours of duty in Iran and was on his second tour in Afghanistan in 2012 when he stepped on an IED, resulting in the loss of both legs. Also honored was Sgt. Jason Baldwin of the Citrus Heights Police Department as Police Officer of the Year. His accolades were too many to mention but suffice it to say he deserved the award. Police Chief Christopher Boyd and his family were also in attendance. Boyd was recognized with a Certificate of Commendation for his 10 years of service as our Chief of Police. Boyd will be stepping down as police chief to become the new city manager, replacing Henry Tingle who retires the end of 2016. New at this year’s picnic were two “Missing Man” tables, the traditional military version and, continuing with our solidarity with the Citrus Height police officers, a Missing Man memorial was built to remember all police officers who have lost their lives in the line of duty. The Legion received a very appreciative thank you from the police department for this memorial as it meant quite a bit to them all. The CHPD provided their imposing emergency rescue vehicle, a gutted army tank, a 2009 Navistar Maxxpro MRAP, as a popular photo opportunity. Horses Healing Heroes, 4 Paws 2 Freedom and Canine Companions for Independence were a resource favorite, matching up these animals with our veterans. Dozens of other veteran and non-profit resources were available. Attendees again enjoyed the traditional BBQ lunch of hot dog, hamburgers, and hot wings prepared again by Wild Wade’s BBQ & Grill of Citrus Heights. Members of the American Legion Auxiliary Unit 637, GFWC Citrus Heights Women’s Club and the Lion’s club provide hundreds of cookies and beverages. Our day was a big success and we look forward to another great event next year!